M18™ Brushless 7-1/4" Circular Saw delivers up to 40% more power than circular saws with brushed motors, while providing up to 30% more run-time. The Milwaukee® built motor, REDLINK™ electronics and REDLITHIUM™ XC5.0 battery provide more efficient power delivery, more power and fewer trips to the charger. With 5,000 RPM, the 2631 provides smooth cutting, and at only 9.0 lbs, it is lighter than most corded saws. 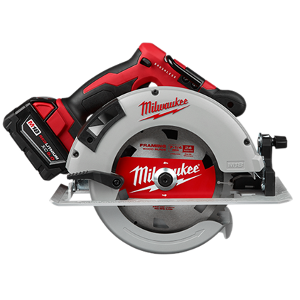 The 7-1/4” Brushless Circular Saw also features an integrated rafter hook, magnesium guards, an aluminum shoe and LED light.